This beautifully crafted wood crate contains the entire collection of cards from the original Apples to Apples Core Game plus Expansion Sets 1 & 2. 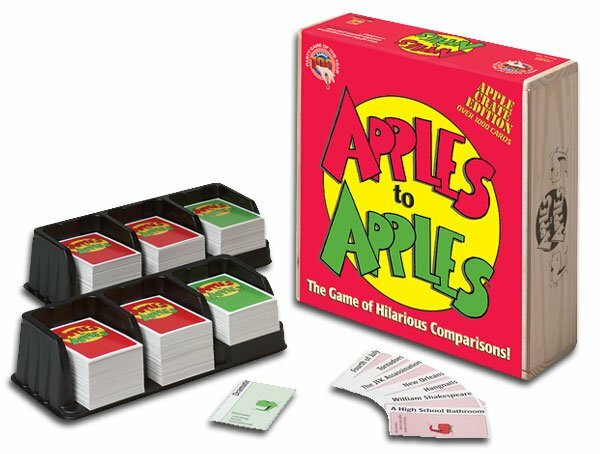 APPLES to APPLESÂ® is the wild, award-winning card and party game that provides instant fun for four to ten players! Itâ€™s as easy as "comparing apples to apples"... just open the box, deal the cards, and youâ€™re ready to play! Select the card from your hand that you think is best described by a card played by the judge. If the judge picks your card, you win that round. And everyone gets a chance to be the judge! Each round is filled with surprising and outrageous comparisons from a wide range of people, places, things and events. Fast moving and refreshing, APPLES to APPLES is perfect for any get together with family and friends! We love Apples to Apples because it's a game all ages can enjoy playing together. When we have company, this game gets the kids off the electronic games and around the table laughing and enjoying each other. I also use it in my English as a Second Language class. My students learn new words and have a great deal of fun while playing and learning! This is one of the funnest games I have ever played! It is Hilarious! This game is VERY easy to play and you can have up to 10 people play! I loved this game! It is great for family parties, friends, ANYONE! Its HILARIOUS!